Criticism is a double-edged sword. On one hand it can improve you, but on the other hand, it can shatter your confidence if you allow it. Knowing how to deal with criticism is vital to improving yourself in both your professional and personal lives. How do you feel when someone criticizes you? Maybe you’ve had someone criticize your work, effort, or personal aspects of your life. You may feel hurt or angry and you may even become defensive. Be mindful of whether any criticism offered to you or just given to you is constructive or destructive, healthy and well-intentioned or toxic and abusive. Learn to filter out that which is toxic and unhelpful as well as unconstructive. There are so many times in life when we have to deal with criticism that it’s essential to learn how to deal with it. Certainly you don’t want someone else’s opinion to prevent you from having a happy and productive life, right? The first step in dealing with criticism is to figure out whether it’s worth considering. Sometimes we may confuse personal attacks with criticism. They’re definitely not the same. It is only constructive criticism that you want to spend any time or energy reflecting upon and seeing what you can learn from it. 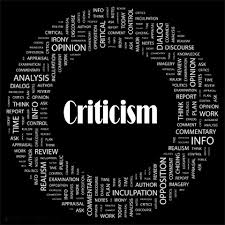 There are two kinds of criticism: constructive criticism, which is intended to help us improve and keep communication open, and destructive criticism, which is used to humiliate and control. Whether you’re dealing with criticism in the work place, at home, or with friends, it’s essential to be able to deal with critical comments. Your feelings will inevitably be hurt, so the first thing to do is give yourself a few minutes to process the information before reacting. Take some deep breaths, and determine why the criticism was delivered. Thinking before you react will help you avoid unnecessary conflict, pain, or embarrassment. If you determine there’s no truth to the criticism, you may find it appropriate to use a technique called distracting, where you calmly acknowledge that you heard what the other person said. Don’t become defensive or upset, just acknowledge the statement and leave it at that. • You can acknowledge the other speaker with a general response, such as I appreciate you sharing your opinion. or You might be right. Leaving an open end doesn’t allow room for more argument. It will also put the other person at ease, and may even allow you to change the subject. One of the hardest things to do when you’re criticized is to admit that it’s true. You don’t have to be overly apologetic. You can always say, I’m sorry or It’s my mistake and move on. By admitting fault, you’re taking ownership of the problem and you’re proving that you’re a mature adult. Once you’ve admitted your mistake, strive to get past the barrier and heal the rift between you. • When communicating, strive not to use the word but when admitting the truth of the criticism. That puts stipulations on why you were wrong. Swallow your pride and go on. On the other hand, if you’re not sure whether the criticism is justified or not, you may want to request more detailed feedback. This will not only help you gain more information, but also help the other person clarify the facts. • An example of this might be if someone tells you that your work is sloppy. By finding out their expectations, you can deliver what they’re looking for instead of fumbling around trying to figure out what sloppy means. Everyone has different expectations. The key to not confusing judgment or unkind “criticism” with constructive criticism is to be very aware of your expectations and adjust them to each situation, or person you are dealing with so that you do not take on unconstructive criticism – judgment actually – that can be toxic and abusive and not healthy or helpful at all. You get to decide the sources, groups, people, and so forth whose feedback you trust and whose constructive criticism you will give reflection and thought to. It is important to know who is not trustworthy in this way. People that don’t know you. People that you do not know well enough to know if you can trust them. Learning to take any and all criticism with a grain of salt and add your own ideas, thoughts, and reflections to it and/or to balance it will help you in your self-discovery process. It will enable you to stay open to a lot of noise and filter out what is useful and valuable constructive criticism. If you take criticism too personally and/or in an unfiltered way, you’re letting someone else be disempower you. Being open to criticism and feedback that is constructive means not taking what others say inside yourself too deeply. You can think and reflect on what makes sense and what doesn’t for you. You can empower yourself by becoming stronger at recognizing what is constructive criticism given to help you versus toxic unhealthy “other agenda” judgmental unconstructive and equally often erroneous so-called criticism that you need not even waste your time letting in or thinking about. Let if just roll off your back, let it go. Don’t let others rattle you, it’s really not worth spending your energy or allowing yourself to feel frustration. And remember: you can’t control others; you can only control yourself. So that means you have a choice in your response to criticism: you can ignore the criticism, use it as a motivator, or become upset and angry. The choice is yours. Hopefully, if receiving constructive criticism is a challenge for you, you can be mindful and radically accepting that constructive criticism, while helpful, is not the last word on anything to do with you. You get that last determination to make for yourself. You can choose with mindful awareness and observing techniques and radical acceptance to not take in what does not fit for you and therefore no end up upset or angry. In DBT, “Teflon mind”. © A.J. Mahari, September 28, 2014 – All rights reserved.